Rpt last row 48 more times until 50 rows have been worked in all. Do not Turn at the end of last row. 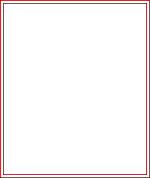 to last sc, skip last sc, sl st to first sc. Turn. Rpt Pattern Row until 27sc rows have been work in all from base. Turn. Fasten off. Join in contrast color and rpt Pattern Row four more times. Turn. Eyelet Row - ch1, 1sc in base of ch1, * ch1, skip 1sc, 1sc in next sc, * rpt from * to * around to last sc, ch1, skip last sc, sl st to first sc. Turn. Next Row - ch1, 2sc in base of ch1, * skip ch1 space, 2sc in next sc, * rpt from * to * to last ch1 space, skip last ch1 space, sl st to first sc. Turn. Rpt Pattern Row three more times. Fasten off. Join in main color and rpt Pattern Row four more times. DNT. Working back over sc just worked, work 1 row of crab stitch. (see abbrev) Fasten off. 2nd Row - ch1, 1sc in base of ch1, 1sc in each sc to end. Turn. Buttonhole Row - ch1, 1sc in base of ch1, ch2, skip 2sc, 1sc in last sc. Turn. 4th Row - ch1, 1sc in base of ch1, 2sc in ch2 space, 1sc in last sc. Turn. 5th Row - ch1, 1sc in base of ch1, 1sc in each sc to end. Turn. Rpt last row 68 more times until 73 rows have been worked in all from beginning. Turn. 74th Row - Rpt Buttonhole Row. Turn. 75th Row - ch1, 1sc in base of ch1, 2sc in ch2 space, 1sc in last sc. Turn. 76th Row - ch1, 1sc in base of ch1, 1sc in each sc to end. Fasten off. Finishing - Weave in any loose ends of yarn, thread contrast color ribbon through eyelet holes and tie in a bow. Attach 2 wooden buttons to each side of bag equally (approx 3 Inches from each side) and fasten through buttonholes on straps. 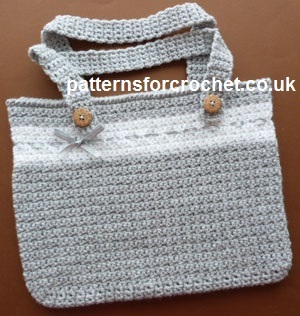 Hope you enjoy this free crochet pattern for an everyday bag.